This little book is just larger than the size of my small palm. 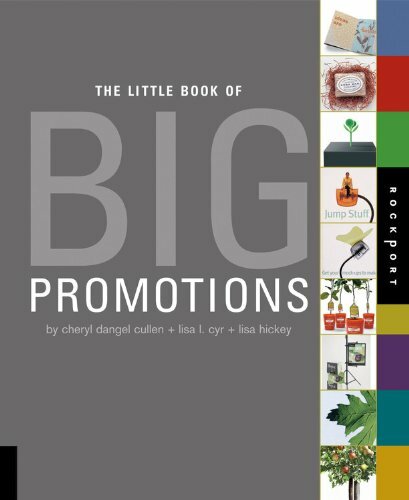 This book includes a collection of graphic design focused on promotions and events. Each design is explained in terms of goal and how the design was created towards that goal. You'll get to read about the design process, such as how a designer purchased lots of gum at a grocery store for a gum project. There are 350 pages. Every 2 page is one design featured. So that's more than hundreds of designs for reference. A reviewer from Amazon.com said that this book is a repackage of other books, namely Promotion Design That Works, The Art of Promotion and Designs That Speak Up, Stand Out and Can't Be Ignored: Promotions. Just so you know.